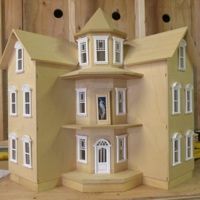 Two Victorianna dollhouses bashed "back to back" like a row house. The Victorianna is the half scale version of Greenleaf's McKinley. 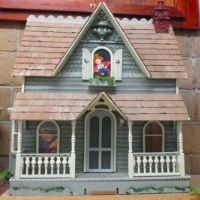 I bought this house as an assembled shell. 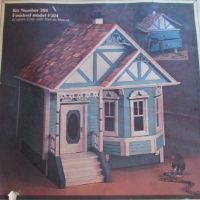 The builder based the design on a discontinued kit from Carlson / American Craft. 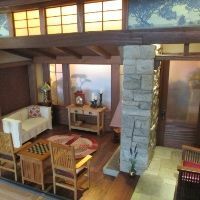 This house was designed by Rocky Mountain Woodcrafts, with similarities to another kit named the Visalian. I'm planning to make this a modern beach / vacation home. This limited edition Victorian was made by Jim Marcus and Lew Kummerow in the late 1970s. I bought it from the stock of a store that had been closed 30 years. I bought this as a basic shell, scratch built from gatorboard, for $2 at a flea market. 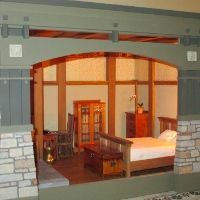 I'm making it a "tiny house" with a Spanish Revival feel. 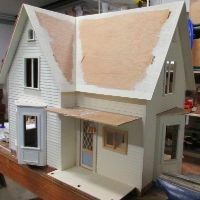 This die-cut Greenleaf kit was my first half scale house and one of my first builds. I started it in January 2004 and continued, on and off, for more than six years. Two Rosedale kits bashed into one! This was my first major kitbash and also my first experience with Greenleaf's laser cut kits. It worked out well on both counts. 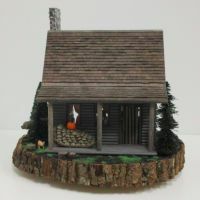 A log cabin modeled after the one in Laura Ingalls Wilder's Little House in the Big Woods. 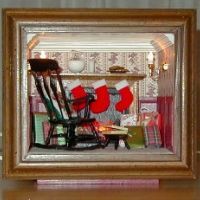 The kit is a "Sugar and Spice" log cabin kit that I bought off eBay. 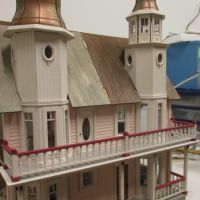 This cottage is modeled after an HO scale Mille August "pull apart" house. It was created by Jackie Kerr Deiber in the late 1980s. I bought the unfinished shell off eBay. 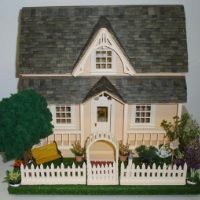 Another "pull apart" house made by Jackie Kerr Deiber. I bought it partially finished off eBay. I don't know its official name so I've dubbed it the Townhouse. 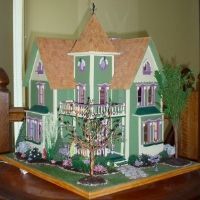 This is the "A Place for All Seasons" dollhouse, which Bill Lankford taught in classes in the 1990s. I bought it off eBay in 2014 and plan to fix it up as an old-timey Tudor. 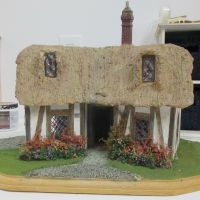 An English cottage built in a 1993 Bill Lankford class. It's fully enclosed with a roof that lifts off. I got it off eBay in 2016 with plans to re-landscape and finish the inside. 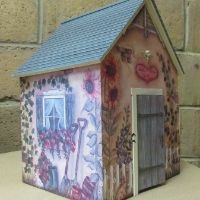 A cottage that started out as a Creatology puzzle house, sold at Michaels craft stores. It's meant to be a toy but cleans up nicely! 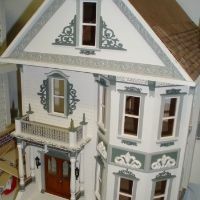 This is a "House of Hidden Treasures" kit from American Craft, the same company that manufactured the Queen Anne Rowhouse. 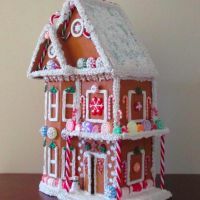 My mom and I turned two Creatology puzzle houses into faux gingerbread houses for Christmas 2015. They look good enough to eat! 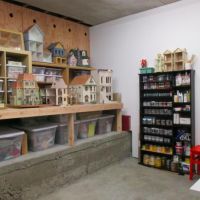 This is a huge dollhouse! 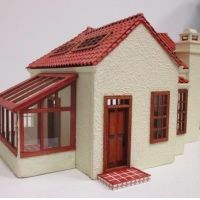 It was manufactured by a company named MiniWright in the 1970s. I bought it off Craigslist in 2010 and am gradually finishing it. A Greenleaf Arthur with a Mary Engelbreit vibe. I can't take any credit so far — I got it for free from someone who was going to throw it out! I started this as a Greenleaf Community project in 2005, but let it linger unfinished for years. In 2014 I admitted I'd probably never complete it, and re-homed it. The Arthur was a Greenleaf Community build in 2005. After finishing and displaying it for a while, I sold it to a family who gave it to their daughter for Christmas. I bought this house off Craigslist planning to rehab it, but never finished. In 2008 I gave the house to a woman who hoped to redo it for her granddaughter. 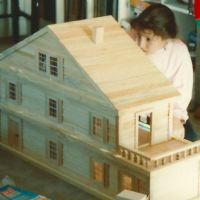 This was the first dollhouse kit I built. It took about a year between 2002 and 2003. I never completely finished it, but learned a lot. I gave the house away in 2012. 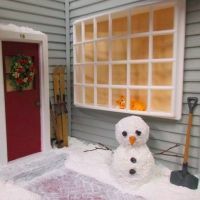 A rotating 1:24 scale vignette with four seasonal variations on the same scene. 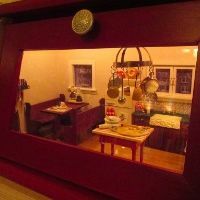 A 1:12 scale, holiday-themed roombox inside a breadbox. I made this to display several Hallmark kitchen ornaments. 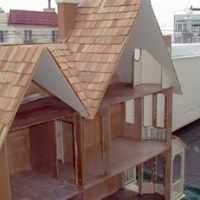 A 1:12 scale, Mission-style roombox taught by the Guys from Texas at the Good Sam show in 2010. 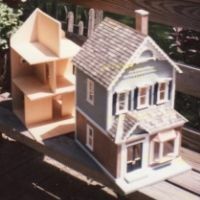 A 1:12 scale, Mission-style roombox from a class taught by the Guys from Texas in 2006. 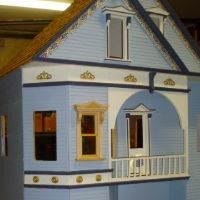 A 1:24 scale porch vignette at twilight. 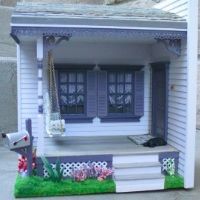 I made this from an "Infinite Possibilities Porch" kit by Houseworks. 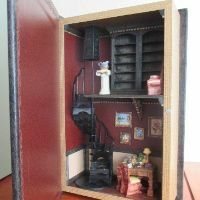 A 1:24 scale library inside a "book box" from Pier 1. The spiral staircase is made from a wooden fan. 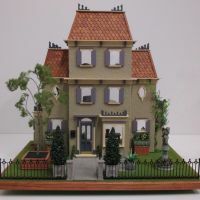 This is a 1:12 roombox sold by Victoria Miniland. After years of thinking about it, I started work in late 2017. A NAME national convention souvenir from 1996, designed by Pam Junk, that I got at a flea market. 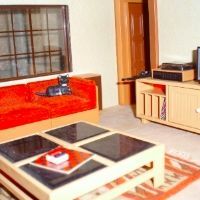 A 1:12(ish) scale roombox made for my parents in 2003. My minis have come a long way since then! I bought this as a kit off eBay back in 2005. 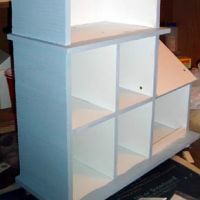 It's supposed to be a curio cabinet but makes a good half scale display. 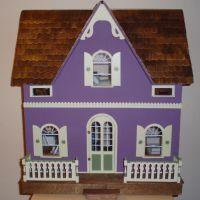 This 3/4" scale (1:16) house is from the early 1980s. 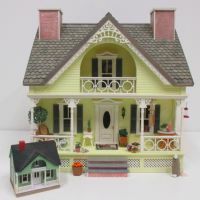 Also known as the "Smaller Home and Garden" dollhouse. 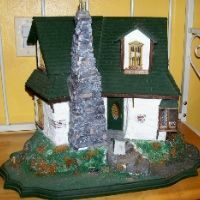 My parents gave me this 1:12 scale house for Christmas in 1990. 25 years and a cross-country move later, it's still standing! 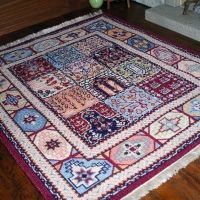 I've been doing counted cross stitch and needlepoint since 1995. I'm out of wall space so now I mostly stitch petit point instead of life sized pieces.